Raphael was the fifth of 8 children born to James Harold John and Annie Sarah, nee Bull. James was born in Holborn in 1860 and Annie was born in the same year in Beaulieu. They married in Lymington in 1881. Annie died in Southampton in 1936 and James passed away in the city in 1949. Married George H Withers in Camberwell in 1941. James Harold b.1882 and d.1963 Southampton. Married Louisa Terrell in Southampton in 1911. Married Mary E. Haskell in Southampton in 1939. Joseph Charles b.1885 and d.1934 Southampton. Married Edith Alice Phillips in Southampton in 1906. Arthur Leal b.1887 and d.1969 St Austell. Married Gwendoline G Ridgley in Southampton in 1938. Frederick Samuel b.1892 and d.1952 Southampton. Married Elsie M Ryder in Southampton in 1914. May Theresa b.1900 and d.1978 Southampton. Married Edward T Bennett in Southampton in 1920. Albert Edward b.1902 and d.1980 Southampton. Married Eileen Hammett in Southampton in 1926. Married Naomi Jones in Southampton in 1967. In 1913 Raphael married Lily May House in the Parish of Fawley; Lily was born in Portsmouth in 1890. Lily gave birth to their son, Raphael Andrew, in Fawley in 1913. Lily remained in the area after her husband’s death and married Henry R Ellis in 1920. Raphael Andrew married Elsie Perry in Leeds in 1940 and they had 4 children between 1943 and 1948, their first-borns being twins. Raphael died in Leeds in 1983. The 17th Field Company was attached to the 48th Division and arrived in France in March 1915. Raphael almost certainly perished during the Second Battle of Ypres which began in April 1915. This was the first time the Germans used poison gas and the Allies were forced to withdraw rapidly. Raphael is remembered on the Ypres (Menin Gate) Memorial, Panel 9. Sandra and Alan Bellenie will light a candle and turn off the lights this evening in memory of Mr Bellenie’s grandfather, Raphael Bellenie, 25, a Royal Engineer who was killed at Ypres in May 15, leaving a widow, Lily May, 20, and a son, aged 23 months. 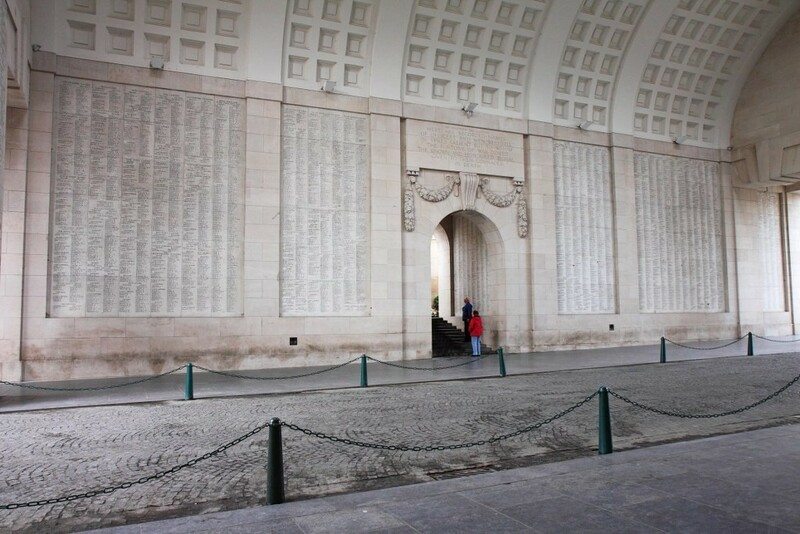 Raphael Bellenie’s name is inscribed on the Menin Gate among thousands of others.